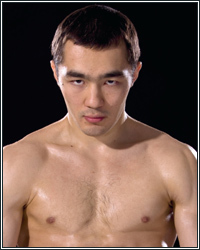 BEIBUT SHUMENOV: "I AM READY FOR THE OPPORTUNITY TO FIGHT ON HBO AND SHOWTIME"
"I have been trying to unify for the last year as this is my goal, so I'd like to put my belt on the line against the other World Champions. If I still can't make those fights next, I'd like to fight one of the other top 175-pounders, like Pascal or Erdei...I came to Las Vegas to train and spar with the best. I know how important it is to get exposure in the US to build a fan base. I would be honored and I am ready for the opportunity to fight on HBO and Showtime," stated WBA light heavyweight champion Beibut Shumenov as he talked about his future plans after his recent win over Danny Santiago. Check it out! PC: Congratulations on your win over Danny Santiago. How do you feel about your performance? BS: My goal is to improve with each fight and fight to the very best of my abilities. I haven't reached my full potential and I will keep training hard. I knew Danny was tough, but not that tough. I prepared to face the best Danny Santiago and that's what I got. PC: You pretty much dominated the fight. What was your game plan going into the fight and did you think if you executed your plan it would be that kind of night for you? BS: Danny is very experienced and tried to draw me in close to counter me, but I had to remain patient until I had a chance to finish it, which happened in the ninth round. I respect Danny a lot; he's a warrior. PC: Now that you are starting to fight guys with a ton of experience, like Santiago and Joppy, how do you feel you are growing as a fighter? You've dealt with those veterans pretty well? BS: I've learned a lot fighting guys like Santiago and Joppy. Experienced fighters know every trick in the book and fighting them has helped me to become a better fighter. PC: Did Santiago do anything that surprised you during the course of the fight or did you pretty much get what you expected from him? BS: The way he came out surprised me a little bit. He obviously prepared to fight my style and, like I said earlier, he was in tremendous shape. PC: How important was it for you to avenge your only loss to Gabriel Campillo to move forward with your career? BS: It meant a lot to me and my dream to become a World Champion. PC: The light heavyweight division is wide open for young contenders. What type of opponent would you like to face next? BS: I have been trying to unify for the last year as this is my goal, so I'd like to put my belt on the line against the other World Champions. If I still can't make those fights next, I'd like to fight one of the other top 175-pounders, like Pascal or Erdei. PC: You're starting to fight in the States more as your career progresses. Do you feel like that is important to gather more of a fan base? BS: Yes. I came to Las Vegas to train and spar with the best. I know how important it is to get exposure in the US to build a fan base. I would be honored and I am ready for the opportunity to fight on HBO and Showtime. PC: How long will you take off from the gym? BS: The gym is my home. I love training and that's where I learn and improve. PC: Is the plan to take the rest of the year off or would you like to fight again before the end of the year? BS: There will be plenty of time for me to rest when I'm retired. I'm already preparing for my next fight. PC: At the pace you are moving at, it's hard to believe that you only have 13 fights as a professional. Are you pleased with the way you are being moved along so far? BS: Honestly, I really don't think about that. I just want to improve with each fight and gain valuable experience so I can compete with the best in the sport. PC: I appreciate your time. Congratulations again on the win and the knockout. Is there anything you want to say in closing; anybody you want to thank? BS: I want to thank my parents and my brother, Chingis, and all my team, including my closest confidante, Cary. Also, my fans for all of their support I've received too. I've still got a long way to go and I'll do my very best to get there.